Happier National Day, Singapore! | I Paint and Twist Anything! Two months have just flown by and it’s National Day tomorrow! Some quick personal annoucements, I decided to leave my first job officially on 28th of June 2013. After graduating from NUS Psychology in 2012, my Adjunct Associate Professor, Douglas Abrams, offered me a fun time job at Expara (full time job I mean). So I spent my first year after graduation doing business development for Expara, a local venture capital firm providing funding, advisory and training for entrepreneurs with innovative technology-driven businesses. It was a tough decision to leave because I have been blessed with a great boss and colleagues. Then and again, we are only young once. So while I am still young, energetic and not tied down with too many commitments, why not just do something I really love? So yes! I am running Happier Singapore full time! Whoopee! I love the challenge of running this business. It is very fast paced so it doesn’t give me any chance of getting bored. Apart from being an entertainer, I need to oversee the marketing, finances, public relations and human resource aspects as well. I could probably hire someone, but it is very important to me that I am able to have a personal touch with all of our clients. We are always on our toes to ensure that every party or event we go to, we are able to deliver exceptional service! I’m also always making a note to self to make time for my own family, boy friend and friends amidst the happier hustle. It’s not getting any easier, but I am getting a hang of it. We have regular updates on Facebook in case you are looking for more pictures on our balloon sculptures! Also, if you are looking for NDP face painting, a team of students from Temasek Junior College will be situated along Orchard Road to paint you some orchids and Singapore flags! Please feel free to approach them for your face or hand painting! All proceeds will be going to the Children’s Cancer Foundation. 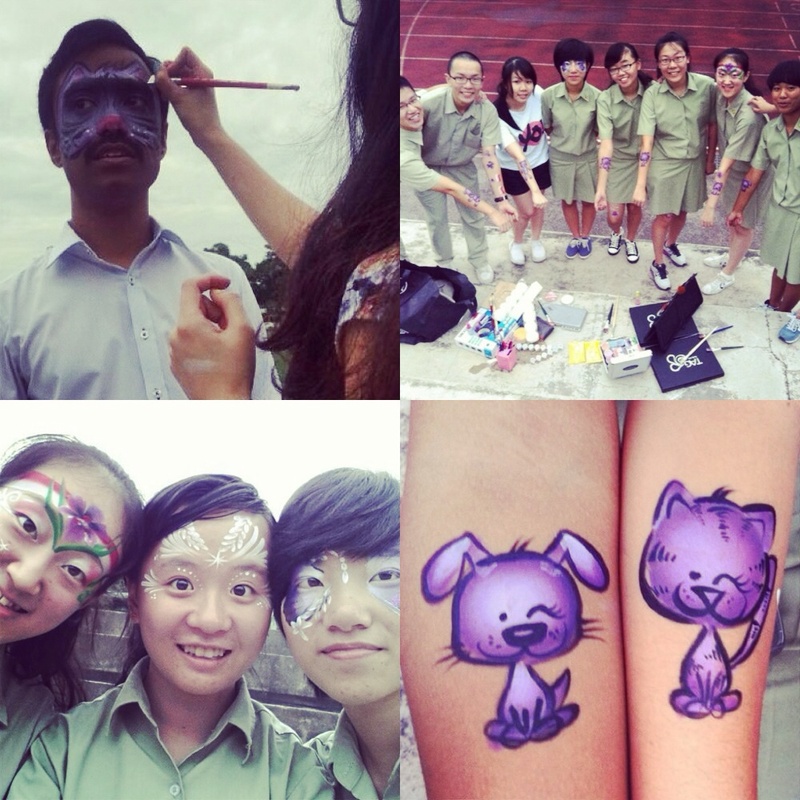 Such a meaningful way of spending their NDP holidays! 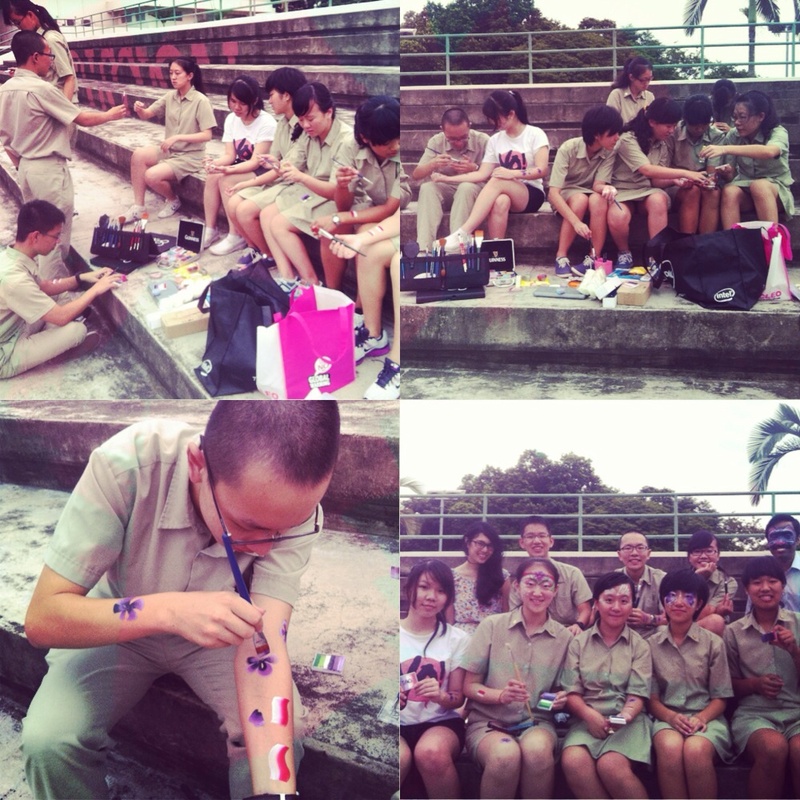 We had the NDP charity face painting 1-h crash course just this Monday on the TJC campus! It was really a joy to share the art with Kevin and gang! It was a pleasant surprise to have my good friend, Mr Ashraf and his brother, Mr Aaron, pop by at the end of the session too! Have a Happier National Day everyone! 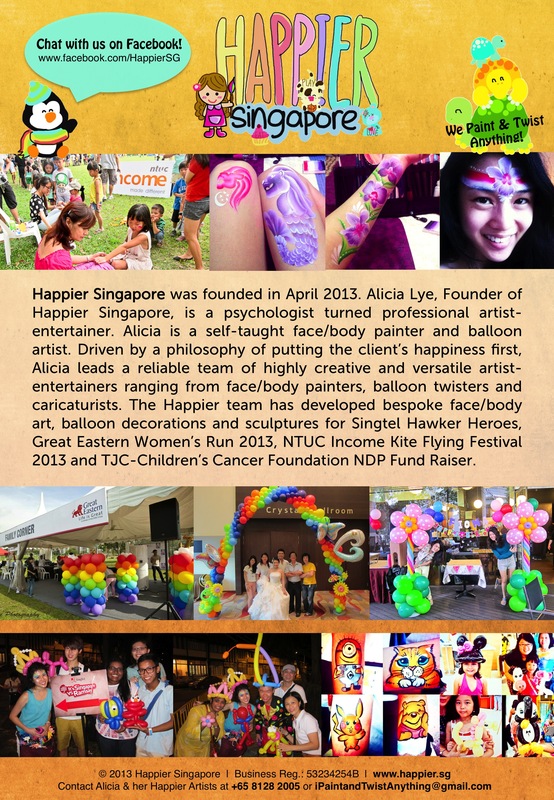 This entry was posted in Balloon Twisting, Face Painting and tagged balloon sculpting, balloon sculptor, balloon twister, balloon twisting, charity, face paint, face painter, face painting, kids party ideas, learn, national day, NDP, party entertainer, singapore, workshop. Bookmark the permalink.